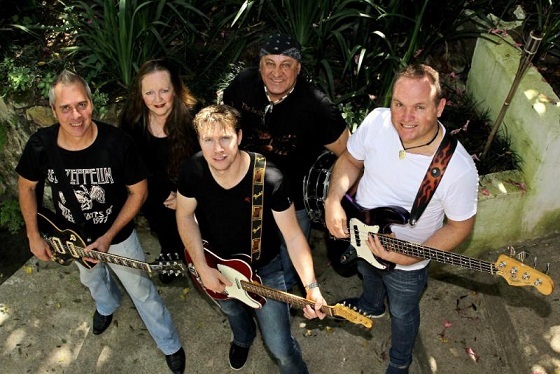 The Reals and guest guitarist Shaun Dragt are back by popular demand when they present their show The British Invasion at Rhumbelow Theatre in Durban from November 30 to December 9, 2018. The British Invasion was a cultural phenomenon of the mid 1960s when rock and pop music acts from the United Kingdom became popular in the United States and significant to rising ‘counterculture’ on both sides of the Atlantic. Pop and rock groups such as The Beatles, the Dave Clark Five, The Kinks, the Rolling Stones and The Animals were at the forefront of the invasion, furnishing the model for many important global developments in pop and rock music. In February 1964, The Beatles started the first British Invasion, appearing on the Ed Sullivan Show. They held the top five positions on the US Billboard Hot 100 singles chart which to date, no other act has achieved and it wasn’t long before other UK bands joined the Invasion. The Rolling Stones would become the biggest band other than the Beatles to come out of this era, topping the Hot 100 eight times. In America, the Invasion spelled the end of the popularity of instrumental surf music, pre-Motown vocal girl groups, the folk revival and the teen idols who had dominated the American charts in the late 1950s and 1960s. The British Invasion had a profound impact on popular music, internationalising the production of rock and roll, establishing the British popular music industry as a viable centre of musical creativity, and opening the door for subsequent British performers to achieve international success. The US no longer had the monopoly and US media proclaimed the United Kingdom as the centre of music and fashion. During the 80s and 90s, the resurgence of British rock bands such as Oasis, The Verve and Blur met massive global success. Paying tribute to the artistes pioneering and those who continued with the British Invasion will be Barry Thomson on guitar, Dawn Selby on keyboards, Mali Sewell on drums, Jason Andrew on bass guitar and guest guitarist Shaun Dragt. In the repertoire of hit songs from decades 60s through to the 90s, are pop and rock hits from top British bands including The Beatles (I Saw Her Standing There), The Animals (We Gotta Get Out Of This Place), The Who (My Generation), Rolling Stones (Start Me Up), Led Zeppelin (Rock And Roll), Oasis (Wonderwall) and many more! Shows run from Friday to Sunday from November 30 to December 9 with performances on Fridays and Saturdays at 20h00 and on Sundays at 14h00. The venue opens 90 minutes before show for picnic dinner. Tickets R150 (R130 pensioners first weekend only). Take along food picnic baskets. Braais will be available. There is limited secure parking and booking is essential. A cash bar is available (no alcohol may be brought on to the premises). Rhumbelow Durban is situated at 42 Cunningham Road off Bartle Road in Umbilo.